You are here: Home / My Books / Lights! Curtains! Cows! Each summer in Ellis, Manitoba, Frank Derksen stages “The Legend of Cow Valley”, a play about an exciting town legend. Traditionally, the town’s grade-seven kids are the stars. This is all about to change when Mr. Derksen sells part of his farm to the government as a historic site. There is no greater fan of The Legend of Cow Valley than Becky Kowalski, who has dreamed all her life of playing Catastrophe Cate, the show’s hero. When the play is going to close for good, charistmatic Becky rallies her best friend Greg and the rest of their grade-seven friends to save it. However, Ms. Noring, the stern government official in charge of the new historic site, stands in the way of their plans. Worst of all, Ms. Noring is planning to stage a new play that the kids recognize instantly as an incredible flop. With determination and plenty of hilarious twists and turns, Becky, Greg and their friends begin to practice The Legend of Cow Valley in secret and plan a surprise performance for the town. But with an adversary like Ms. Noring, can they really pull it off? Read an excerpt from Lights! Curtains! Cows! CHAPTER ONE – Curtains For Cow Valley? I slammed my locker door. “I can’t believe it!” I said. “Get a hold of yourself, Greg,” said my friend, Mike Leduc. He glanced up and down the hallway, looking nervous. It was crammed with students hurrying to class. “No more Legend of Cow Valley?” I asked. “I don’t think that has anything to do with it,” Mike said. This was crazy! The Legend of Cow Valley was a play performed on Mr. Derksen’s farm every summer for only about the last gazillion years! It was a tradition in our town, Ellis, Manitoba, for the grade seven kids to be the cast. We were supposed to have auditions for Cow Valley in the school gym next week. Then, we were supposed to rehearse the play with Mr. Derksen and our drama teacher for the last few drama classes of the school year. Then, for the whole summer, we were supposed to perform The Legend of Cow Valley once a week on Mr. Derksen’s outdoor stage. How could it be cancelled this year, when it was supposed to be our turn? It wasn’t fair! “But Cow Valley has lots of historic parts already!” I said, trying not to shout. The story of The Legend of Cow Valley takes place in Ellis over a hundred years ago. My mom said that like most legends, it wasn’t exactly a true story, but that lots of stuff in it was based on history. For instance, the play got its name from Ellis’ old nickname “Cow Valley” (because of all the cattle farms in the area, of course). Some of the characters in the play were named after real people who had lived in Ellis in the olden days. And then there is the outdoor set, which looks like a street from a cowboy movie. My dad told me that Mr. Derksen had studied black and white photos of Ellis’s Main Street from a hundred years ago when he built the set, to get the details just right. That was pretty “historic”! “A museum won’t be the same. It can’t possibly be as fun as Cow Valley!” I said. Who is Lights! Curtains! Cows! for? In other words, young readers – this book is for you! But parents and grown-ups, I hope you can join in on the fun, too! You can ask for “Lights! Curtains! 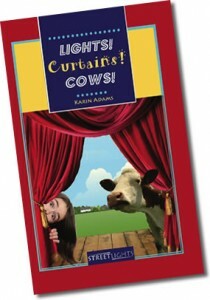 Cows!” by Karin Adams at your favourite local bookstore. It is published by James Lorimer & Company Ltd. and distributed by Formac Lorimer Books in Canada, and by Orca Book Publishers in the USA. ISBN10: 1-55277-426-0 or ISBN13: 978-1-55277-426-7. “Lights! Curtains! Cows!” is carried by most major booksellers around the world! To find an online seller in your country, or just want to see more shopping options, you can do a web search for “Lights! Curtains! Cows!” by Karin Adams.